I work in the Christmas business all year long. And because of that, I think sometimes people wonder if maybe I get a little bit jaded about Christmas: Since I'm around Christmas-related activity all the time, doesn't that blunt the joy and excitement of Christmas when the holiday season rolls around? Nope. I'm happy to say that it doesn't. Because there is this one little side effect of working in the Christmas business that detracts just a bit from my joy of Christmas each year. And that's simply the same common, easily avoided mistakes that I see people making with their Christmas lighting each and every year. There are 6 of them, in fact, that people make over and over, every Christmas season. It makes their Christmas season less enjoyable than it could be. And that makes me a little bit sad. Here are those 6 mistakes that many people -- maybe you -- make every single holiday season. Have you seen homes lit up with nothing but warm white lights? It happens a lot. But what could be more boring? Christmas should be colorful, not dull and monochrome! You don't have to make your house look like a kaleidoscope, but adding just a splash of color to your foundation of white can make all the difference. Or go all out with every color under the rainbow. After all, when you're driving around looking at Christmas lights during the season, which displays make you tap the brakes and say "ooh" and "aww"? It's never the house dressed blandly in all white, is it? Just about every big box store sells Christmas lights. And they sell them cheap. But when you buy cheap, you get cheap. That's because those stores are buying their lights from bottom-rung manufacturers - that's why the lights are so cheap. And that's why there are so many quality issues with those lights. Yes, those cheap lights will be more likely to fail than quality lights. But that's not the only problem. Those lights simply won't offer the same visual impact as quality lights - the same depth of color, the same crispness, the same uniformity of color. Spending a bit more by purchasing your lights from a specialty retailer of Christmas lights can result in a dramatic upgrade to your display. When it comes time to start installing your Christmas lights, do you follow a well thought out plan? Or do you just figure it out as you go? Many Christmas Enthusiasts just simply start hanging lights, without any sort of design or plan in mind. They just hope that it turns out well. While installing Christmas lights certainly isn't rocket science, having a plan in hand for your home's lighting can have a huge impact on the outcome. Just take a little time to draw out a schematic of your home, and then plan what lights you'll use and where you'll use them. Planning ahead will result in a better-looking design, and will also offer some additional fringe benefits. You'll be able to make certain that you have all the lights and supplies you'll need on hand, before you begin. And if you plan well in advance, you'll also be able to save money by taking advantage of off-season deals for lights and accessories. You've heard it many times: What's the best way to eat an elephant? One bite at a time. And that's really the best approach for building a Christmas light display, too. Do you have aspirations for creating a truly spectacular Christmas display for your home? That's wonderful. But don't try to do it all at once. If you're a newbie, just start out with a foundational display this year. Add a bit more next year. And some more the following year. And the year after that. Building your grand display by adding to it year after year offers several benefits. It spreads the costs out over time. It's less overwhelming and frustrating. And perhaps most importantly, it helps you to end up with a truly refined design that is the result of careful long-term planning. #5) Paying a Holiday Visit to an E.R. It's a sad truth that the holiday season can be a dangerous time of year. 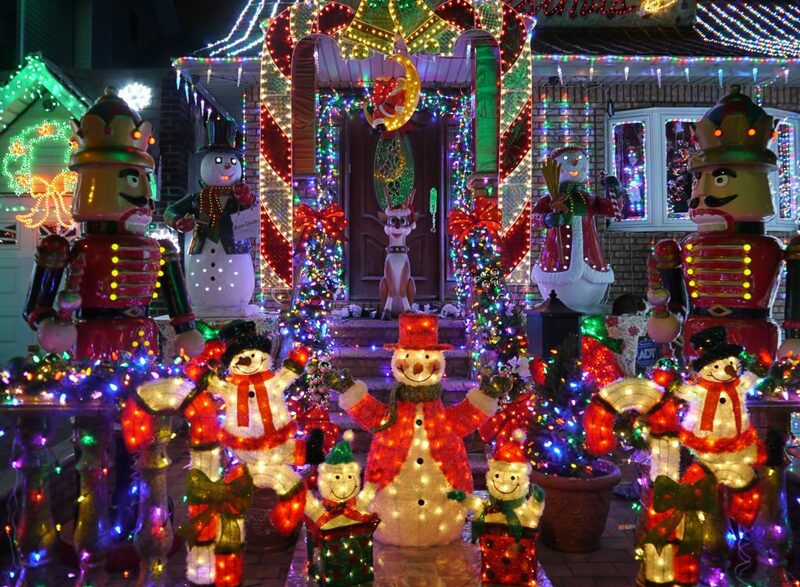 Lots of Christmas Enthusiasts are hurt annually during the process of installing or removing Christmas lights. According to the Consumer Product Safety Commission, about 250 injuries per day -- more than 15,000 per year -- occur during the holiday season. The most common injuries are falls, lacerations, and back strains - most directly related to the process of installing Christmas lights. 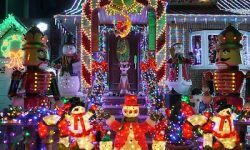 It can be a particularly dangerous time because many Christmas Enthusiasts simply aren't accustomed to climbing ladders and scampering around on rooftops. That's why it's so important to put serious thought into being safe during the process. Make sure you have the proper equipment, such as safe ladders, and shoes suitable for the job. Be certain that you're employing the proper techniques for hanging the lights. And if you don't feel that you're quite up to the job, there's certainly no shame in hiring a professional installer. After all, a hospital bed isn't a particularly pleasant place from which to celebrate Christmas. C'mon! You're not still using incandescent lights, are you? If so, you're a member of a rapidly dwindling group. But unfortunately, there are lots of people who still refuse to climb onto that LED bandwagon. Why? It's probably a holdover effect of some quality problems that admittedly impacted the appearance and reliability of early LED bulbs. So if you're a holdout from using LED Christmas lights, you're missing out on some really great benefits. And that's just a little sad! As I mentioned above, working in the Christmas business all year does nothing to lessen my enjoyment of Christmas. But it does bother me to see so many people making these 6 common mistakes. Because when people make these mistakes it makes Christmas less enjoyable for them. And these mistakes are so easily avoided. So as you prepare for this Christmas season, why not take a moment to examine your game plan for the upcoming holiday? Just tweak your plans as needed to assure that you'll be avoiding these 6 oh-so-common mistakes. It's an easy way to make Christmas even more enjoyable for you and for me.